Turtle Bay House is a wonderful spot for those looking to wake up and see the gorgeous Caribbean water each morning and watch the sun set each night. The villa is open and airy, so you’ll always feel the breeze and smell the island aromas. It’s been recently updated, so Turtle Bay now features a lovely combination of travertine floor tiles, granite countertops, and mahogany woodwork throughout. Spend your days by the pool just to the left of the villa, or make use of the available watersports equipment and stroll down the staircase to the beach. Meals are made so easy in the fully outfitted kitchen, or walk a quick two minutes to Sugar Cane Restaurant. Turtle Bay House, located in Nail Bay Resort, offers the perfect balance of sophistication and relaxed comfort and features a beautiful quiet beach, accessible by a path below the home. Turtle Bay House has recently been renovated to the highest of standards with travertine tile, granite, stainless steel hardware of the highest quality, and custom mahogany millwork, doors and windows throughout. Lay back with a drink in hand on the spacious shady terraces that span from each bedroom to the pool and lounge area. Enjoy the ocean, and gaze upon the surrounding islands and sunset scenery that seem to go on forever. Situated above Mountain Trunk Bay amidst beautiful tropical gardens, this lovely house offers four bedrooms, each featuring en-suite bathrooms. 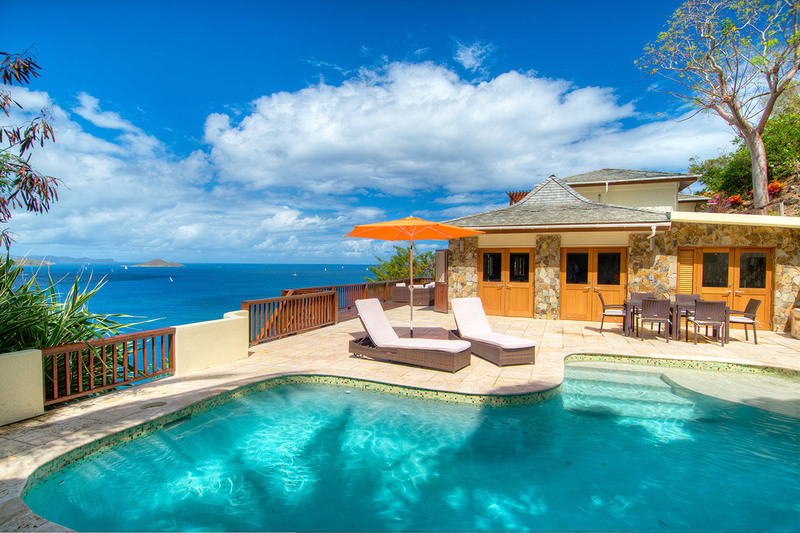 All rooms open onto spacious patios with breathtaking views of Sir Francis Drake Channel and the islands surrounding Virgin Gorda. The Great Room is a wonderful place to relax, unwind and enjoy the magnificent views. Complimentary Wi-Fi at the Sugar Cane Restaurant.